The following sermon was preached by Revd Dr Thomas Winger in the seminary’s Martin Luther chapel on 24 February 2017, the Festival of St Matthias, Apostle. The text is Acts 1:15-26. Dear brothers and sisters of our Lord Jesus Christ: Dr Stephenson likes to wear a cheeky t-shirt that reads, “Jesus is coming. Look busy!” I expect the returning Son of God will be able to see through any childish attempts just to “look” busy. But like the office worker who quickly alt-tabs his screen away from his game of solitaire when a co-worker pops his head through the door, we naturally feel guilty that we mightn’t be working quite hard enough at what Jesus left us to do. This notion might be encouraged by the words of the angels to the 11 apostles after Jesus’ ascension: “Men of Galilee, why do you stand looking into heaven? This Jesus, who was taken up from you into heaven, will come in the same way as you saw Him go” (Acts 1:11). In other words, don’t just stand there with your gob hanging open; He’s given you a job to do; get at it! And indeed a job He had given them: “you will receive power when the Holy Spirit has come upon you, and you will be My witnesses in Jerusalem and in all Judea and Samaria, and to the end of the earth” (Acts 1:8). If the angels were ATS visitors, they’d be asking the apostles to make substantial progress on their five-year strategic plan and report back next October! It’s a task that’s mind-boggling in its complexity—to create an institutional structure to support the manpower needed to preach the Gospel to millions of people, province by province, to the world’s end. And yet what do they do? Do they return to Jerusalem to engage an architect to design their purple palace, and establish a foundation to fund the mission, and begin interviewing potential missionaries? No. They go back to the upper room—the place where Jesus had met with them to break bread and give it to them as His Body, where He’d revealed Himself after the resurrection as the One triumphant over death, where He’d spoken His peace to them and given them the mandate to forgive sins—there they gathered with Jesus’ mother and brothers and the other women to pray. Prayer isn’t a strategy. Prayer isn’t a tool or a weapon. Prayer is the self-denying, self-emptying confession that there’s nothing in us that can accomplish God’s plan. Prayer is the humble acknowledgement that God is the One who does it all. That’s why they went back to the upper room. There they were reminded that Jesus hadn’t abandoned them to their own devices, but that He was still with them through the very things He’d done for them in that upper room. It was the place where He’d given them the holy mandate to forgive sins and sent them out in His name. It was a holy place, a place of true pilgrimage, a place for them to turn back to Him in prayer. And to go there was to be faithful to Jesus, who had said: “stay in the city until you are clothed with power from on high” (Lk. 24:49); and “you will receive power when the Holy Spirit has come upon you” (Acts 1:8). It’s passive. Wait, and you will receive. And while they’re waiting, they turn to an order of business that’s as baffling to human eyes as the seemingly unimportant act of prayer. They turn to the Scriptures to find out what God has in store for them next. While waiting for the Spirit’s power, they listen to the Spirit’s words. And from the story of David they learn that the betrayer must be replaced. So the first action of this worldwide Christian movement is to fill a vacant position. “Let another take his episcopal office” (Acts 1:20b), they read from Psalm 109—words of King David crying out to God against his enemy that are fulfilled when the betrayer of David’s Son is punished and replaced. There’s no human logic to it. And I dare say that a former corporate gunslinger like Kirk would say that they should have taken advantage of the natural attrition brought on by Judas’ demise to move forward with a more lean and efficient ecclesiastical machine. But the Lord doesn’t work that way. There was a place in God’s plan that needed to be filled, an office left vacant. Jesus chose twelve, and twelve there would be. No matter how pointless it seemed to human minds, God’s Word and Spirit would determine the way of Christ’s Church. And so they put forward two men who fulfilled the apostolic requirements of being disciples of Jesus throughout His earthly ministry and eyewitnesses of His resurrection: “Joseph called Barsabbas, who was also called Justus, and Matthias” (Acts 1:23). If a nomination form was ever biased to the obvious candidate, this was it: there’s a man with three names who’s known to be “righteous” … and then there’s Matthias. But again the Lord does things His way. And as the early Christian community commit the choice entirely into God’s hands through prayer and the casting of lots, God chooses the lesser of the candidates. Matthias is added to the company of the apostles, God’s twelve are restored, He has His new Israel. And Matthias is never heard from again. He has had his hour upon the stage. Do we have such courageous faith as these early followers of Jesus had? We make our excuses that such stories as this are descriptive, not prescriptive, and that we could never run the church this way. But is that just an expression of unbelief? This early post-Easter story teaches us in every line that God was running the show and that all He asked of His apostolic servants was to be His instruments. That’s the meaning of the continuous prayer that runs through our text—prayer doesn’t change things; God changes things; prayer is faith’s acquiescence to this truth. Prayer is the confession that it’s God’s plan that matters, God’s choice, not ours—even when His choice seems to make little sense. As it did when Christ chose Judas. For that’s there in the story, as well. 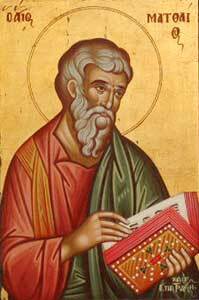 Peter himself said it: “for he was numbered among us and he was allotted his share in this ministry” (Acts 1:17). The word there is κλῆρος, from which we get “cleric” and “clergy”—one allotted an office by God. The language echoes the life of an OT priest, who was born into office and served at the Temple when his straw was drawn. And so it was entirely in God’s hands. No one chose it. As Jesus Himself once said to the apostles, “You did not choose Me, but I chose you and appointed you” (Jn 15:16).